This isn't going to be easy, but, um, you know how you go on some random squee site and see really adorable pictures of the new tiger cubs born, let's say, at the Copenhagen Zoo? Yeah, well, some of those cubs were probably euthanized to help control the tiger population and recreate the extremely high cub mortality rate in the wild. It's just all part of making animals in captivity feel more at home. We'd rather they have as natural behavior as possible. We have already taken away their predatory and antipredatory behaviors. If we take away their parenting behavior, they have not much left. To have animals maintain their "natural behavior," Holst and many of his European colleagues let animals give birth to offspring, raise those offspring to a certain age, when zookeepers then take those cubs, kits, pups, and whelps that don't figure into the zoo's breeding plans and euthanize them. 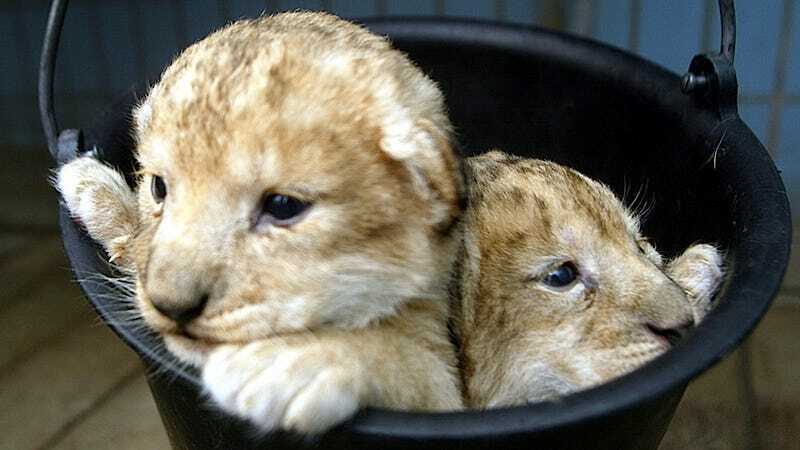 Why, just this spring, the Copenhagen Zoo euthanized two 2-year-old leopard cubs whose genes were already overrepresented in the zoo's leopard population. In the wild, 80 percent of feline offspring die before they reach maturity, so the Danish strategy mimics life in the wild and allows animals the opportunity to reproduce and raise offspring more or less the same way they would if they weren't languishing around a really complex nature tableau. American zoos opt for birth control, claiming that this more easily prevents inbreeding among populations, allowing animals like gorillas, for instance, to remain in their family units without giving birth to genetically redundant offspring. Hormones in contraception, moreover, can dull some aggressive mating behavior in males, which can help create a way mellower zoo experience for easily-rattled visitors. The problem, however, with giving birth control to animals is that, while it's safe for some, it can present a myriad of health problems for others. Birth control works best with apes because they're the most similar to humans, but some big cats can develop uterine infections or tumors as a result of birth control implants. European zoos arguing against contraception cite the potential health risks, though some employ euthanasia with more zeal than others — Denmark, for example, is very open with the public about its euthanasia practices, while Germany only employs euthanasia in "reasonable" circumstances, which, for zookeepers, can be a little ambiguous, meaning anything from, "There are too many anteaters and we're instituting a Shirley Jackson lottery," to "There is no way I can euthanize this tiger cub — it just mewed at me."